This post is the first in a series I've wanted to do for many years on my blog. I've just finished my 12th year as a school librarian. Before that, I taught seventh grade Literature and English for 3 years. I started my teaching career with a valuable class called New Jersey Writing Project of Texas (now called Abydos), and followed it up with the New Jersey Reading Project of Texas. I do not personally have a history with Abydos, but if it is based on NJWPT, I highly encourage you to look into attending a conference if you can. I am so thankful that my school district at the time had the foresight to send me to that class in the summer before my first day as a teacher. I started my teaching career using picture books with older readers, and I still do it today! Picture books are increasingly recognized as excellent springboards for discussion with older readers. There is a whole heap of research supporting using picture books with older readers, as well as librarian and teacher blogs with ideas for implementation. Picture books are not just for the kiddies anymore. 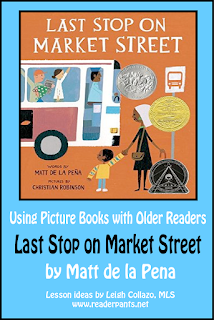 So I'm going to start my Picture Books With Older Readers series with a new favorite: Matt de la Pena's The Last Stop on Market Street. This and future picture books posts will give librarians and teachers ideas to use the picture books with older readers. Since I personally taught middle school (and still do, as a librarian), I am going to focus mainly on middle school lessons. I'm sure many of these ideas could be adapted for HS or ES lessons as well. I chose this book as my first for this series because I did not expect to like it. It won the 2016 Newbery Award, an unheard-of feat for a picture book. I thought that as much as I love picture books, there is no way I would agree with a picture book winning the Newbery. The Newbery goes to a novel, y'all! So I read the book. And then I did an about-face. 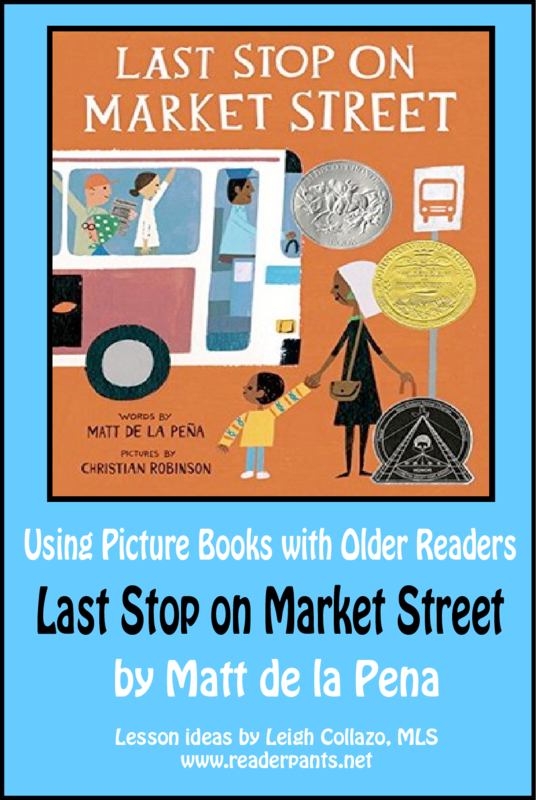 The Last Stop on Market Street totally deserved to win the Newbery. It's just that beautiful and simple and perfect for its message. A grandmother and grandson are traveling by bus across town. As they travel, the boy asks lots of questions about why they don't have a car, why there is trash everywhere, why they have to stand in the rain, why he doesn't have a bike or ipod. For each question, the grandmother answers with a positive spin on the question. and old Mr. Dennis, who always has a trick for you." Optimism vs. pessimism; looking for the good in ugly things; finding the bright side. I want my students to be cognizant of their own thinking and the fact that attitude determines much. Quiz: Are you an optimist or a pessimist? Directions: For each question in the quiz, think about which answer is more accurate for you. Which answer is more optimist or more pessimist? Encourage movement by asking students to stand to the right, left, or middle (unsure) based on which statement they agree with. READ THE BOOK ALOUD WITH STUDENTS. Set up the book for a read-aloud first. Picture books do not tend to win the Newbery. Mention this to students and tell them to keep that in mind as they listen. Be sure to show the pictures (it also won a Caldecott Honor). Also ask the students to think about or write down examples of different ways of seeing the same situation. The grandmother spends lots of time with the boy, and she may even have custody of him. Context clues--they do this trip every Sunday, they seem comfortable together, they talk about the daily, mundane things of life. No mother or father mentioned in the story. The grandmother and the boy are poor. Context clues--they do not have a car, they eat at the soup kitchen, the boy complains that he doesn't have a bike or an ipod. The story is set in a big city. Context clues--bus transport, taxis, lots of people, diversity, soup kitchen. The boy complains that it "isn't fair" that they do not have a car. Is he correct? Do you think the boy would be happier if they did have a car? What if everyone had a car? What manners and communication skills does the grandmother teach the boy? Is there a line between pessimism and realism? Optimism and denial? Do you think the grandmother is seeing the world through "rose-colored glasses'? Do you think her view is realistic? Library: Use as a springboard for themed booktalk. Possibilities: very poor families, urban life, homelessness, other Newbery winners. Art: Compare the artwork to that of Ezra Jack Keats' The Snowy Day. How are they similar and different? Social Studies: Discuss public transportation options in your area. Do most people drive cars? Is better public transport needed? What are the pros and cons of public transportation for cities? For individuals? Social Studies: What does your community do to help those who have difficulty providing for themselves or their families? Is there a soup kitchen in your area? Organize a can food drive and donate to the local food pantry. Photography: Go to a boring, mundane location in or outside the school. Look for the beauty in the everyday, and photograph it to highlight the beauty. Great post! Thank you so much. I will be using your lesson ideas again! Can't wait for the next picture book idea! Thanks, Sandra! I am excited to continue this series! I loved this post!! Great ideas, I look forward to more. I am at an international school in Japan. Thanks for these lesson ideas! I like your range of questioning. However, I don't think Nana and CJ are eating at the soup kitchen, I believe they are serving. Do you see their hair nets? They also don't have trays like everyone else. Nana is passing handing out a bowl. Oh, wow! I'm going to go have another look at the book today. Very interesting!